Pope Paul VI (Latin: Paulus VI), born Giovanni Battista Enrico Antonio Maria Montini (Italian pronunciation: classicistranieri.com/pope-paul-vi.html/?wiki-maping=[dʒioˈvani baˈtista enˈriko antoˈnjo maˈrja monˈtini]" rel="nofollow">[dʒioˈvani baˈtista enˈriko antoˈnjo maˈrja monˈtini]; 26 September 1897 – 6 August 1978), was Pope from 21 June 1963 to his death in 1978. Succeeding Pope John XXIII, he continued the Second Vatican Council which he closed in 1965, implementing its numerous reforms, and fostered improved ecumenical relations with Eastern Orthodox and Protestants, which resulted in many historic meetings and agreements. Montini served in the Vatican’s Secretariat of State from 1922 to 1954. While in the Secretariat of State, Montini and Domenico Tardini were considered as the closest and most influential co-workers of Pope Pius XII, who in 1954, named him Archbishop of Milan, the largest Italian diocese, while not naming Montini a cardinal, a designation that traditionally accompanies the position; Montini automatically became the Secretary of the Italian Bishops Conference. John XXIII elevated him to the College of Cardinals in 1958, and after the death of John XXIII, Montini was considered one of his most likely successors. In fact, John XXIII had sent oblique signals during his papacy that Montini would make a fine pope. Montini, upon his election to the papacy, took the pontifical name Paul VI to indicate a renewed worldwide mission to spread the message of Christ, therefore, being the most recent pontiff to date to take that pontifical name. He re-convoked the Second Vatican Council, which was automatically closed with the death of John XXIII, and gave it priority and direction. After the council had concluded its work, Paul VI took charge of the interpretation and implementation of its mandates, often walking a thin line between the conflicting expectations of various groups within Catholicism. The magnitude and depth of the reforms affecting all fields of Church life during his pontificate exceeded similar reform policies of his predecessors and successors. Paul VI was a Marian devotee, speaking repeatedly to Marian congresses and mariological meetings, visiting Marian shrines and issuing three Marian encyclicals. Following his famous predecessor Ambrose of Milan, he named Mary as the Mother of the Church during the Second Vatican Council. Paul VI sought dialogue with the world, with other Christians, other religions, and atheists, excluding nobody. He saw himself as a humble servant for a suffering humanity and demanded significant changes of the rich in North America and Europe in favour of the poor in the Third World. His positions on birth control (see Humanae Vitae) and other issues were often controversial, especially in Western Europe and North America. His pontificate took place during many significant world events, e.g. the John F. Kennedy assassination of November 1963, five months after becoming pope, the Vietnam War, the millennium anniversary of the baptism of Poland in 1966, the student revolts, the Warsaw Pact invasion of Czechoslovakia, the continued breakup of the British Empire, the continued push for civil rights in the US and the advent of the contraceptive pill, legal abortion, increased marital separation, annulments, divorce and homosexual rights movements in many developed countries in the wake of their sexual revolutions, as well as increased crime and drug abuse in these countries. Paul VI died on 6 August 1978, the Feast of the Transfiguration, in Castel Gandolfo, after a period of ill health. As per his will, he was buried in the grottos of the Vatican not in an ornate tomb, but a grave in the ground as he wished. The diocesan process for the beatification of Paul VI began on 11 May 1993, and so he was given the title “Servant of God“. The diocesan process concluded its business in 1998. On 20 December 2012, Pope Benedict XVI, in an audience with the Cardinal Prefect of the Congregation for the Causes of Saints, declared that the late pontiff had lived a life of heroic virtue, which means that he can now be called “Venerable“. A miracle attributed to the intercession of the late pope discovered and was approved on 9 May 2014 by Pope Francis in an audience with the Cardinal Prefect of the Congregation for the Causes of Saints. The beatification ceremony for Paul VI shall be held on 19 October 2014, which means that he will be called “Blessed”. Giovanni Battista Montini was born in the village of Concesio, in the province of Brescia, Lombardy in 1897. 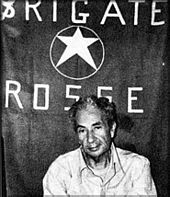 His father Giorgio Montini was a lawyer, journalist, director of the Catholic Action and member of the Italian Parliament. His mother was Giudetta Alghisi, from a family of rural nobility. He had two brothers, Francesco Montini, who became a physician, and Lodovico Montini, who became a lawyer and politician. On 30 September 1897, he was baptized in the name of Giovanni Battista Enrico Antonio Maria Montini. He attended Cesare Arici, a school run by the Jesuits, and in 1916, he received a diploma from Arnaldo da Brescia, a public school in Brescia. His education was often interrupted by bouts of illness. In 1916, he entered the seminary to become a Roman Catholic priest. He was ordained priest on 29 May 1920 and celebrated his first Holy Mass in Brescia in the Basilica of Santa Maria delle Grazie. Montini concluded his studies in Milan with a doctorate in Canon Law in the same year. Afterwards he studied at the Gregorian University, the University of Rome La Sapienza and, at the request of Giuseppe Pizzardo at the Accademia dei Nobili Ecclesiastici. At the age of twenty-five, again at the request of Giuseppe Pizzardo, Montini entered the Secretariat of State in 1922, where he worked under Pizzardo together with Francesco Borgongini-Duca, Alfredo Ottaviani, Carlo Grano, Domenico Tardini and Francis Spellman. In 1925 he helped found the publishing house Morcelliana in Brescia, focused on promoting a ‘Christian inspired culture’. After his Polish mission, Giovanni Battista Montini returned to Rome, where soon he began to work in the Vatican. Later, as pope, he wanted to return to Poland on a Marian pilgrimage, but he was not permitted by the Communist government, a request that it later could not deny to the native son Karol Wojtyla, who became Pope John Paul II. Montini on the day of his ordination. It is true, my service to the pope was not limited to the political or extra-ordinary affairs according to Vatican language. The goodness of Pope Pius XII opened to me the opportunity to look into the thoughts even into the soul of this great pontiff. I could quote many details how Pius XII, always using measured and moderate speech, was hiding, nay revealing a noble position of great strength and fearless courage. After the death of Cardinal Alfredo Ildefonso Schuster, OSB in 1954, Montini was appointed Archbishop of Milan, which made him automatically the speaker of the Italian Bishop Conference. Pope Pius XII presented the new Archbishop Giovanni Battista Montini “as his personal gift to Milan”. He was consecrated in Saint Peter’s Basilica by Cardinal Eugene Tisserant, the Dean of the College of Cardinals, since Pius XII was forced to stay in bed due to his severe illness. Pius XII however, delivered the sermon about Giovanni Batista Montini from his sick-bed over radio to the many faithful assembled in St. Peter’s on 12 December 1954. Both Montini and the pope had tears in their eyes when Montini parted for his dioceses with 1,000 churches, 2,500 priests and 3,500,000 souls. On 6 January 1955, Montini formally took possession of his Cathedral of Milan. Pius XII, who always wanted to be a pastor rather than a Vatican bureaucrat, gladly granted Montini this opportunity which was denied to him. Montini after a period of preparation, liked his new tasks as archbishop, connecting to all groups of faithful in Milan. He enjoyed meetings with intellectuals, artists and writers. Cardinal Giovanni Battista Montini walking in Saint Peter’s Square in 1962. In his first months he showed his interest in working conditions and labour issues by personally contacting unions, associations and giving related speeches. Believing that churches are the only non-utilitarian buildings in modern society and a most necessary place of spiritual rest, he initiated over 100 new Church buildings for service and contemplation. His public speeches were noticed not only in Milan but also in Rome and elsewhere. Some considered him a liberal, when he asked lay people to love not only Catholics but also schismatics, Protestants, Anglicans, the indifferent, Muslims, pagans, atheists. He engaged in friendly relations with a group of Anglican clergy visiting Milan in 1957 and a subsequently exchanged letters with the Archbishop of Canterbury, Geoffrey Fisher. Montini and Angelo Roncalli were considered to be friends, but when Roncalli, as Pope John XXIII announced a new Ecumenical Council, Cardinal Montini reacted with disbelief and said to Giulio Bevilacqua: “This old boy does not know what a hornets nest he is stirring up.” He was appointed to the Central Preparatory Commission in 1961. During the Council, his friend Pope John XXIII asked him to live in the Vatican. He was a member of the Commission for Extraordinary Affairs but did not engage himself much into the floor debates on various issues. His main advisor was Monsignore Giovanni Colombo, whom he later appointed to be his successor in Milan The Commission was greatly overshadowed by the insistence of John XXIII to have the Council complete all its work in one single session before Christmas 1962, to the 400th anniversary of the Council of Trent, an insistence which may have also been influenced by the Pope’s recent knowledge that he had cancer. During his period in Milan, Montini was known as a progressive member of the Catholic hierarchy. Montini went new ways in pastoral care, which he reformed. He used his authority to ensure that the liturgical reforms of Pius XII were carried out at the local level and employed innovative methods to reach the people of Milan: Huge posters announced that 1000 voices would speak to them from 10 to 24 November 1957. More than 500 priests and many bishops, cardinals and lay persons delivered 7000 sermons in the period not only in churches but in factories, meeting halls, houses, courtyards, schools, offices, military barracks, hospitals, hotels and other places, where people meet. His goal was the re-introduction of faith to a city without much religion. “If only we can say Our Father and know what this means, then we would understand the Christian faith.” Montini recognized that Western Europe had become mission country again and was not too optimistic about the outcome of this massive undertaking. But for all his dedication to regular working people, Montini was also a man of letters, favouring classic Italian writers like Alessandro Manzoni‘s I Promessi Sposi, which to him, was almost a gospel of Christianity. Montini as the Archbishop of Milan circa 1956. Although some cardinals seem to have viewed him as papabile (a person suitable to become pope), and although he seems to have received some votes in the 1958 conclave, Montini was not a member of the College of Cardinals and thus was not a serious candidate at that conclave. [c] Instead Angelo Roncalli was elected pope and assumed the name John XXIII. On 17 November 1958, less than three weeks after the election of the new pope, the L’Osservatore Romano announced a consistory for the creation of new cardinals. Montini’s name topped the list. The new pope raised Montini to the cardinalate in 15 December 1958, becoming Cardinal-Priest of Ss. Silvestro e Martino ai Monti. He appointed him simultaneously to several Vatican congregations which resulted in many visits by Montini to Rome in the coming years. As a Cardinal, Montini journeyed to Africa (1962), where he visited Ghana, Sudan, Kenya, Congo, Rhodesia, South Africa, and Nigeria. Later, he would be the first pope to visit Africa. After his journey, John XXIII gave him a private audience on his trip which lasted for several hours. In fifteen other trips he visited Brazil (1960) and the USA (1960), including New York City, Washington, DC, Chicago, the University of Notre Dame in Indiana, Boston, Philadelphia, and Baltimore. The cardinal spent his vacations usually in a reclusive Benedictine monastery Engelberg Abbey in Switzerland. Montini was generally seen as the most likely successor to Pope John XXIII because of his closeness to both Popes Pius XII and John XXIII, his pastoral and administrative background, and his insight and determination. John XXIII, a newcomer to the Vatican at age 76, may have felt outflanked by the professional Roman Curia at times; Montini knew its most inner workings well due to the fact that he had worked there for a generation. Unlike the papabile cardinals from Bologna and Genoa, he was not identified with either the left or right, nor was he seen as a radical reformer. He was viewed as most likely to continue the Second Vatican Council, which already, without any tangible results, had lasted longer than anticipated by John XXIII, who had a vision but “did not have a clear agenda. His rhetoric seems to have had a note of over-optimism, a confidence in progress, which was characteristic of the 1960s.” When John XXIII died of stomach cancer on 3 June 1963, it triggered a conclave to elect a new pope. 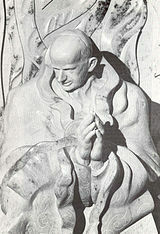 Montini was elected pope in sixth ballot of the papal conclave on 21 June and he took the pontifical name of “Paul VI”. When the Dean of the College of Cardinals Eugene Tisserant asked if he accepted the election, Montini said “Accepto, in nomine Domini” (“I accept, in the name of the Lord”). At one point during the conclave, it was claimed, Cardinal Gustavo Testa lost his temper and demanded that opponents of Montini halt their efforts to thwart his election. The white smoke first rose from the chimney of the Sistine Chapel at 11:22 am, Cardinal Alfredo Ottaviani in his role as Protodeacon, announced to the public the successful election of Montini. When he appeared on the central loggia, he gave the shorter Apostolic Blessing rather than the longer, traditional Urbi et Orbi. Paul VI knew what was coming. He wrote in his journal: “The position is unique. It brings great solitude. ‘I was solitary before, but now my solitude becomes complete and awesome. '” But he was not afraid of this new solitude which was expected of him. He recognized that it would be futile to seek much outside help, or to confide everything to others. He saw himself as alone, with God. The communication with him must be full and incommensurable. Paul VI did away with much of the regal splendor of the papacy. He was the last pope to date to be crowned; his successor Pope John Paul I replaced the Papal Coronation (which Paul had already substantially modified, but which he left mandatory in his 1975 apostolic constitution Romano Pontifici Eligendo) with a Papal Inauguration. Paul VI donated his own Papal Tiara, a gift from his former Archdiocese of Milan, to the Basilica of the National Shrine of the Immaculate Conception in Washington, DC (where it is on permanent display in the Crypt) as a gift to American Catholics. In 1968, with the motu proprio Pontificalis Domus, he discontinued most of the ceremonial functions of the old Roman nobility at the papal court, save for the Prince Assistants to the Papal Throne. He also abolished the Palatine Guard and the Noble Guard, leaving the Swiss Guard as the sole military order of the Vatican. 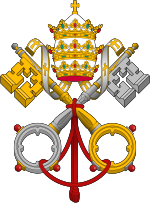 Paul VI decided to continue Vatican II (canon law dictates that a council is suspended at the death of a pope), and brought it to completion in 1965. Faced with conflicting interpretations and controversies, he directed the implementation of its reform goals, which included the largest revision to the Church’s Liturgy ever—and the first major revision since the Council of Trent, held 400 years prior to Vatican II—until his death in 1978. After his election as Bishop of Rome, Paul VI first met with the priests in his new dioceses. He told them that in Milan he started a dialogue with the modern world and asked them to seek contact with all people from all walks of life. Six days after his election he announced that he would continue Vatican II and convened the opening to take place on 29 September 1963. In a radio address to the world, Paul VI recalled the uniqueness of his predecessors, the strength of Pius XI, the wisdom and intelligence of Pius XII and the love of John XXIII. As “his pontifical goals” he mentioned the continuation and completion of Vatican II, the reform of the Canon Law and improved social peace and justice in the world. The Unity of Christianity would be central to his activities. He reminded the council fathers that only a few years earlier Pope Pius XII had issued the encyclical Mystici Corporis about the mystical body of Christ. He asked them not to repeat or create new dogmatic definitions but to explain in simple words how the Church sees itself. He thanked the representatives of other Christian communities for their attendance and asked for their forgiveness if the Catholic Church is guilty for the separation. He also reminded the Council Fathers that many bishops from the east could not attend because the governments in the East did not permit their journeys. The Council discussed the texts on the Church, ecumenicism and liturgy. He told the assembled fathers that he intended to visit the Holy Land, where no other pope had been since Peter. In the final session of the Council, Paul VI announced that he would open the canonization processes of his immediate predecessors: Pope Pius XII and Pope John XXIII. Following his predecessor Ambrose of Milan, Pope Paul VI named Mary the “Mother of the Church” during Vatican II. On 14 September 1965, he established the Synod of Bishops as a permanent institution of the Church and an advisory body to the papacy. Several meetings were held on specific issues during his pontificate, such as the Synod of Bishops on evangelization in the modern world, which started 9 September 1974. Pope Paul VI knew the Roman Curia well, having worked there for a generation from 1922 to 1954. He implemented his reforms in stages, rather than in one fell swoop. On 1 March 1968, he issued a regulation, a process that had been initiated by Pius XII and continued by John XXIII. On 28 March, with Pontificalis Domus, and in several additional Apostolic Constitutions in the following years, he revamped the entire Curia, which included reduction of bureaucracy, streamlining of existing congregations and a broader representation of non-Italians in the curial positions. Paul VI revolutionized papal elections by ordering that only cardinals below the age of eighty might participate in future conclaves. In Ecclesiae Sanctae, his motu proprio of 6 August 1966, he further invited all bishops to offer their retirement to the pontiff no later than the completion of their 75th year of age. This requirement was extended to all Cardinals of the Catholic Church on 21 November 1970. With these two stipulations, the Pope filled several positions with younger bishops and cardinals, and further internationalized the Roman Curia in light of several resignations due to age. Reform of the liturgy had been a part of the liturgical movements in the 20th century mainly in France, Robert Schuman, and Germany, Romano Guardini, which were officially recognized by Pius XII in his encyclical Mediator Dei. During the pontificate of Pius XII, the Vatican eased regulations on the use of Latin in Roman Catholic liturgies, permitting some use of vernacular languages during baptisms, funerals and other events. In 1951 and 1955, the Easter liturgies underwent revision, most notably including the reintroduction of the Easter Triduum. The Second Vatican Council made no changes to the Roman Missal, but in the document Sacrosanctum Concilium mandated that a general revision of it take place. After the Vatican Council, in April 1969, Paul VI approved the “new Order of Mass” promulgated in 1970, as stated in the Acta Apostolica Sedis to “end experimentation” with the Mass and which included the introduction of three new Eucharistic Prayers to what was up to then a single Roman Canon. The Mass of Paul VI was also in Latin but approval was given for the use of vernacular languages. There had been other instructions issued by the Pope in 1964, 1967, 1968, 1969 and 1970 which centered on the reform of all liturgies of the Roman Church. These major reforms were not welcomed by all and in all countries. The sudden apparent “outlawing” of the 400-year old Mass, the last typical edition of which being promulgated only a few years earlier in 1962 by Paul’s predecessor, Pope John XXIII, was not always explained well. Further experimentation with the new Mass by liturgists, such as the usage of pop/folk music (as opposed to the Gregorian Chant advocated by Pope Pius X), along with concurrent changes in the order of sanctuaries, was viewed by some as vandalism. In 2007, Pope Benedict XVI clarified that the 1962 Mass of John XXIII and the 1970 Mass of Paul VI are two forms of the same Roman Rite, the first, which had never been “juridically abrogated”, now being an “extraordinary form of the Roman Rite“, while the other “obviously is and continues to be the normal Form – the Forma ordinaria – of the Eucharistic Liturgy”. In 1964, Paul VI created a Secretariat for non-Christians, later renamed the Pontifical Council for Interreligious Dialogue and a year later a new Secretariat (later Pontifical Council) for Dialogue with Non-Believers. This latter was in 1993 incorporated by Pope John Paul II in the Pontifical Council for Culture, which he had established in 1982. In 1971, Paul VI created a papal office for economic development and catastrophic assistance. To foster common bonds with all persons of good will, he decreed an annual peace day to be celebrated on January first of every year. Trying to improve the condition of Christians behind the Iron Curtain, Paul VI engaged in dialogue with Communist authorities at several levels, receiving Foreign Minister Andrei Gromyko and USSR President Nikolai Podgorny in 1966 and 1967 in the Vatican. The situation of the Church in Hungary, Poland and Romania, improved during his pontificate. Countries visited by Pope Paul VI. Pope Paul VI became the first pope to visit six continents, and was the most travelled pope in history to that time, earning the nickname “the Pilgrim Pope”. With his travels he opened new avenues for the papacy, which were continued by his successors John Paul II and Benedict XVI. He travelled to the Holy Land in 1964, to the Eucharistic Congresses in Bombay, India and Bogotá, Colombia. In 1966, however, he was twice denied permission to visit Poland for the 1,000th anniversary of the baptism of Poland. In 1967, however, fifty years after the first apparition, he visited Fátima in Portugal. He undertook a pastoral visit to Africa in 1969. On 27 November 1970 he was the target of an assassination attempt at Manila International Airport in the Philippines. He was unharmed by the would-be assassin Benjamín Mendoza y Amor Flores, who was subdued by the pope’s personal secretary, Pasquale Macchi. Like his predecessor Pius XII, Paul VI put much emphasis on the dialogue with all nations of the world through establishing diplomatic relations. The number of foreign embassies accredited to the Vatican doubled during his pontificate. This was a reflection of a new understanding between Church and State, which had been formulated first by Pius XI and Pius XII but decreed by Vatican II. The pastoral constitution Gaudium et Spes stated that the Catholic Church is not bound to any form of government and willing to cooperate with all forms. The Church maintained its right to select bishops on its own without any interference by the State. 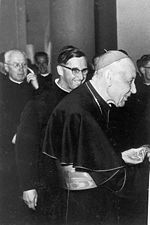 Paul VI with Albino Luciani (later John Paul I) in Venice in 1972. Ecclesiam Suam was given at St. Peter’s, Rome, on the Feast of the Transfiguration, 6 August 1964, the second year of his Pontificate. It is considered an important document, identifying the Catholic Church with the Body of Christ. A later Council document Lumen Gentium stated that the Church subsists in the Body of Christ, raising questions as to the difference between “is” and “subsists in”. 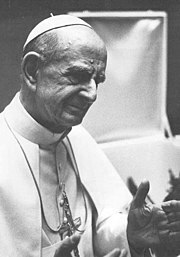 Paul VI appealed to “all people of good will” and discussed necessary dialogues within the Church and between the Churches and with atheism. Sacerdotalis Caelibatus (Latin for “Of the celibate priesthood”), promulgated on 24 June 1967, defends the Catholic Church’s tradition of priestly celibacy in the West. This encyclical was written in the wake of Vatican II, when the Catholic Church was questioning and revising many long-held practices. Priestly celibacy is considered a discipline rather than dogma, and some had expected that it might be relaxed. In response to these questions, the Pope reaffirms the discipline as a long-held practice with special importance in the Catholic Church. The encyclical Sacerdotalis Caelibatus from 24 June 1967, confirms the traditional Church teaching, that celibacy is an ideal state and continues to be mandatory for Roman Catholic priests. Celibacy symbolizes the reality of the kingdom of God amid modern society. The priestly celibacy is closely linked to the sacramental priesthood. However, during his pontificate Paul VI was considered generous in permitting bishops to grant laicization of priests who wanted to leave the sacerdotal state, a position which was drastically reversed by John Paul II in 1980 and cemented in the 1983 Canon Law that only the pope can in exceptional circumstances grant laicization. Paul VI at an audience in October 1977. Populorum progressio, released on 26 March 1967, dealt with the topic of “the development of peoples” and that the economy of the world should serve mankind and not just the few. It touches on a variety of traditional principles of Catholic social teaching: the right to a just wage; the right to security of employment; the right to fair and reasonable working conditions; the right to join a union and strike as a last resort; and the universal destination of resources and goods. In addition, Populorum Progressio opines that real peace in the world is conditional on justice. He repeats his demands expressed in Bombay in 1964 for a large scale World Development Organization, as a matter of international justice and peace. He rejected notions to instigate revolution and force in changing economic conditions. Love is total—that very special form of personal friendship in which husband and wife generously share everything, allowing no unreasonable exceptions and not thinking solely of their own convenience. Whoever really loves his partner loves not only for what he receives, but loves that partner for the partner’s own sake, content to be able to enrich the other with the gift of himself. The reaction to the encyclical’s continued prohibitions of artificial birth control was very mixed. In Italy, Spain, Portugal and Poland, the encyclical was welcomed. In Latin America, much support developed for the Pope and his encyclical. As World Bank President Robert McNamara declared at the 1968 Annual Meeting of the International Monetary Fund and the World Bank Group that countries permitting birth control practices would get preferential access to resources, doctors in La Paz, Bolivia called it insulting that money should be exchanged for the conscience of a Catholic nation. In Colombia, Cardinal archbishop Aníbal Muñoz Duque declared, if American conditionality undermines Papal teachings, we prefer not to receive one cent. The Senate of Bolivia passed a resolution stating that Humanae Vitae could be discussed in its implications for individual consciences, but was of greatest significance because the papal document defended the rights of developing nations to determine their own population policies. The Jesuit Journal Sic dedicated one edition to the encyclical with supportive contributions. Paul VI was concerned but not surprised by the negative reaction in Western Europe and the United States. He fully anticipated this reaction to be a temporary one: “Don’t be afraid”, he reportedly told Edouard Gagnon on the eve of the encyclical, “in twenty years time they’ll call me a prophet.” His biography on the Vatican’s website notes of his reaffirmations of priestly celibacy and the traditional teaching on contraception that “[t]he controversies over these two pronouncements tended to overshadow the last years of his pontificate”. Pope John Paul II later reaffirmed and expanded upon Humanae Vitae with the encyclical Evangelium Vitae, and, Pope Benedict XVI issued in 2005 a short version of the Catechism of the Catholic Church which also repeat the teachings of the Church on this matter. After the Council, Paul VI contributed in two ways to the continued growth of ecumenical dialogue. The separated brothers and sisters, as he called them, were not able to contribute to the Council as invited observers. After the Council, many of them took initiative to seek out their Catholic counterparts and the Pope in Rome, who welcomed such visits. But the Catholic Church itself recognized from the many previous ecumenical encounters, that much needed to be done within, to be an open partner for ecumenism. To those who are entrusted the highest and deepest truth and therefore, so Paul VI, believed that he had the most difficult part to communicate. Ecumenical dialogue, in the view of Paul VI, requires from a Catholic the whole person: one’s entire reason, will, and heart. Paul VI, like Pius XII before him, was reluctant to give in on a lowest possible point. And yet, Paul felt compelled to admit his ardent Gospel-based desire to be everything to everybody and to help all people Being the successor of Peter, he felt the words of Christ, “Do you love me more” like a sharp knife penetrating to the marrow of his soul. These words meant to Paul VI love without limits, and they underscore the Church’s fundamental approach to ecumenism. Paul VI visited the Orthodox Patriarchs of Jerusalem and Constantinople in 1964 and 1967. He was the first pope since the ninth century to visit the East, labeling the Eastern Churches as sister Churches. He was also the first pope in centuries to meet the heads of various Eastern Orthodox faiths. Notably, his meeting with Ecumenical Patriarch Athenagoras I in 1964 in Jerusalem led to rescinding the excommunications of the Great Schism, which took place in 1054. This was a significant step towards restoring communion between Rome and Constantinople. It produced the Catholic-Orthodox Joint declaration of 1965, which was read out on 7 December 1965, simultaneously at a public meeting of the Second Vatican Council in Rome and at a special ceremony in Istanbul. The declaration did not end the schism, but showed a desire for greater reconciliation between the two churches. In May 1973, the Coptic Patriarch Shenouda III of Alexandria visited the Vatican, where he met three times with Pope Paul VI. A common declaration and a joint Creed issued after the visit demonstrated that there are virtually no more[additional citation needed] theological discrepancies between the Coptic and Roman Catholic Churches. Paul VI also met the Catholicos Baselios Augen I of the Malankara Orthodox Syrian Church at his visit to Bombay in India in 1964. Paul VI was the first pope to receive an Anglican Archbishop of Canterbury, Michael Ramsey in official audience as Head of Church, after the private audience visit of Archbishop Geoffrey Fisher to Pope John XXIII on 2 December 1960. Ramsey met Paul three times during his visit and opened the Anglican Centre in Rome to increase their mutual knowledge. He praised Paul VI[e] and his contributions in the service of unity. Paul replied that “by entering into our house, you are entering your own house, we are happy to open our door and heart to you.” The two Church leaders signed a common declaration, which put an end to the disputes of the past and outlined a common agenda for the future. Cardinal Augustin Bea, the head of the Secretariat for Promoting Christian Unity, added at the end of the visit, “Let us move forward in Christ. God wants it. Humanity is waiting for it.” Unmoved by a harsh condemnation by the Congregation of Faith on mixed marriages precisely at this time of the visit, Paul VI and Ramsey appointed a preparatory commission which was to put the common agenda into practice on such issues as mixed marriages. This resulted in a joint Malta declaration, the first joint agreement on the Creed since the Reformation. Paul VI was a good friend of the Anglican Church, which he described as “our beloved sister Church”. This description was unique to Paul and not used by later popes. 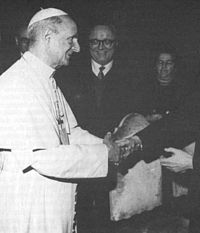 In 1965, Paul VI decided on the creation of a joint working group with the World Council of Churches to map all possible avenues of dialogue and cooperation. In the following three years, eight sessions were held which resulted in many joint proposals. It was proposed to work closely together in areas of social justice and development and Third World Issues such as hunger and poverty. On the religious side, it was agreed to share together in the Week of Prayer for Christian Unity, to be held every year. The joint working group was to prepare texts which were to be used by all Christians. On 19 July 1968, the meeting of the World Council of Churches took place in Uppsala, Sweden, which Pope Paul called a sign of the times. He sent his blessing in an ecumenical manner: “May the Lord bless everything you do for the case of Christian Unity.” The World Council of Churches decided on including Catholic theologians in its committees, provided they have the backing of the Vatican. The Lutherans were the first Protestant Church offering a dialogue to the Catholic Church in September 1964 in Reykjavík, Iceland. It resulted in joint study groups of several issues. The dialogue with the Methodist Church began October 1965, after its representatives officially applauded remarkable changes, friendship and cooperation of the past five years. The Reformed Churches entered four years later into a dialogue with the Catholic Church. The President of the Lutheran World Federation and member of the central committee of the World Council of Churches Fredrik A. Schiotz stated during the 450th anniversary of the Reformation, that earlier commemorations were viewed almost as a triumph. Reformation should be celebrated as a thanksgiving to God, his truth and his renewed life. He welcomed the announcement of Pope Paul VI to celebrate the 1900 anniversary of the death of the Apostle Peter and Apostle Paul, and promised the participation and cooperation in the festivities. Paul VI supported the new-found harmony and cooperation with Protestants on so many levels. When Cardinal Augustin Bea went to see him for permission for a joint Catholic-Protestant translation of the Bible with Protestant Bible societies, the pope walked towards him and exclaimed, “as far as the cooperation with Bible societies is concerned, I am totally in favour.” He issued a formal approval on Pentecost 1967, the feast on which the Holy Spirit descended on the Christians, overcoming all linguistic difficulties, according to Christian tradition. Pope Paul VI held six consistories between 1965–77 that raised 143 men to the cardinalate in his fifteen years as pope. They were held on 22 February 1965, 27 cardinals, 26 June 1967, 27 cardinals, 28 April 1969, 34 cardinals, 5 March 1973, 30 cardinals, 24 May 1976, 20 cardinals, and, 27 June 1977, 4 cardinals. With the six consistories, Paul VI continued the internationalization policies started by Pius XII in 1946 and continued by John XXIII. In his 1976 consistory, five of twenty cardinals originated from Africa, one of them a son of a tribal chief with fifty wives. Several prominent Latin Americans like Eduardo Francisco Pironio of Argentina; Luis Aponte Martinez of Puerto Rico and Eugênio de Araújo Sales and Aloisio Lorscheider from Brazil were also elevated by him. There were voices within the Church at the time saying that the European period of the Church was coming to a close, a view shared by Britain’s Cardinal Basil Hume. At the same time, the members of the College of Cardinals lost some of their previous influences, after Paul VI decreed, that not only cardinals but also bishops too may participate in committees of the Roman Curia. The age limit of eighty years imposed by the Pope, a numerical increase of Cardinals by almost 100%, and a reform of the regal vestments of the “Princes of the Church” further contributed to a service oriented perception of Cardinals under his pontificate. The increased number of Cardinals from the Third World and the papal emphasis on related issues was nevertheless welcomed by many in Western Europe. Pope Paul VI left the Vatican to go to the papal summer residence, Castel Gandolfo, on 14 July 1978, visiting on the way the tomb of Cardinal Giuseppe Pizzardo, who had introduced him to the Vatican half a century earlier. Although he was sick, he agreed to see the new Italian President Sandro Pertini for over two hours. In the evening he watched a Western on TV, happy only when he saw “horses, the most beautiful animals that God had created.” He had breathing problems and needed oxygen. On Sunday, at the Feast of the Transfiguration, he was tired, but wanted to say the Angelus. He was neither able nor permitted to do so and instead stayed in bed, his temperature rising. From his bed he participated in Sunday Mass at 18:00. After communion, the pope suffered a massive heart attack, after which he continued to live for three hours. On 6 August 1978 at 21:41, Pope Paul VI died at Castel Gandolfo. He is buried beneath the floor of Saint Peter’s Basilica with other popes. In his will, he requested to be buried in the “true earth” and therefore, he does not have an ornate sarcophagus but an in-ground grave. The diocesan process for beatification of Servant of God Paul VI began on 11 May 1993 by Pope John Paul II. The title of Servant of God is the first of four steps toward possible canonization. The diocesan process concluded its business in 1998. On 20 December 2012, Pope Benedict XVI approved the declaration of Pope Paul VI as a person of “heroic virtue”, granting him the title of “Venerable”. In December 2013, Vatican officials approved a supposed miracle that was attributed to the intercession of the late pontiff which was the curing of an unborn child in California, U.S.A in the 1990s. It was expected that Pope Francis would approve the miracle in the near future, thus, warranting the beatification of the late pontiff. In February 2014, it was reported that the consulting Vatican theologians to the Congregation for the Causes of Saints recognized the miracle attributed to the late pontiff. On 24 April 2014, it was reported in the Italian magazine Credere that the late pope could possibly be beatified on 19 October 2014. This report from the magazine further stated that several cardinals and bishops would meet on 5 May to confirm the miracle that had previously been approved, and then present it to Pope Francis who may sign the decree for beatification shortly after that. The Congregation for the Causes of Saints held that meeting and positively concluded that the healing was indeed a miracle that could be attributed to the late pope. The matter shall now soon be presented to the pope for approval. The miracle was formally approved on 9 May 2014 by Pope Francis in an audience with the Angelo Amato, Cardinal Prefect of the Congregation for the Causes of Saints. The beatification ceremony for Paul VI shall be held on 19 October 2014, which means that he will be titled as “Blessed”. The pontificate of Paul VI continued the opening and internationalization of the Church started under Pius XII. He implemented the reforms of John XXIII and Vatican II. Yet, unlike these popes, Paul VI faced criticism throughout his papacy from both traditionalists and liberals for steering a middle course during Vatican II and during the implementation of its reforms thereafter. He expressed a desire for peace during the Vietnam War. This was not understood by all. Along with helping those in Third World countries, Pope Paul VI created labour unions and peasant federations in other countries. These public services assisted the poor and became evidence of his desire to complete the goals of the Second Vatican Council. The new theological freedoms, which he fostered – unlike his predecessors and successors, Paul VI refused to excommunicate – resulted in a pluralism of opinions and uncertainties among the faithful. He admonished but did not punish those with other views. New demands were voiced, which were taboo at the Council, the reintegration of divorced Catholics, the sacramental character of the confession, and the role of women in the Church and its ministries. Conservatives complained, that “women wanted to be priests, priests wanted to get married, bishops became regional popes and theologians claimed absolute teaching authority. Protestants claimed equality, homosexuals and divorced called for full acceptance.” Changes such as the reorientation of the liturgy, alterations to the ordinary of the Mass, alterations to the liturgical calendar in the motu proprio Mysterii Paschalis, and the relocation of the tabernacle were controversial among some Catholics. Some critiqued Paul VI’s decision; the newly created Synod of Bishops had an advisory role only and could not make decisions on their own, although the Council decided exactly that. 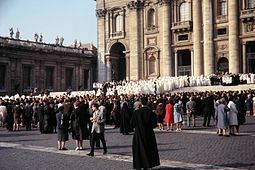 During the pontificate of Paul VI, five such synods took place, and he is on record of implementing all their decisions. Related questions were raised about the new National Bishop Conferences, which became mandatory after Vatican II. Others questioned his Ostpolitik and contacts with Communism and the deals he engaged in for the faithful. The pope clearly suffered from the responses within the Church to Humanae Vitae. While most regions and bishops supported the pontiff, a small but important part of them especially in the Netherlands, Canada, and Germany openly disagreed with the pope, which deeply wounded him for the rest of his life. When Patrick O’Boyle, the Cardinal Archbishop of Washington, DC, disciplined several priests for publicly dissenting from this teaching, the pope encouraged him. What is my state of mind? Am I Hamlet? Or Don Quixote? On the left? On the right? I do not think I have been properly understood. I am filled with ‘great joy (Superabundo gaudio)’ With all our affliction, I am overjoyed (2.Cor.2.4). This inner joy seems to have been a characteristic of Paul VI. His confessor, the Jesuit Paolo Dezza, arrived at the Vatican every Friday evening at 19:00 to hear confession of Paul VI. The only words he ever spoke about his long service to Paul VI during his pontificate were, “that this pope is a man of great joy”. After the death of Pope Paul VI, Dezza was more outspoken, saying that “if Paul VI was not a saint, when he was elected Pope, he became one during his pontificate. I was able to witness not only with what energy and dedication he toiled for Christ and the Church but also and above all, how much he suffered for Christ and the Church. I always admired not only his deep inner resignation but also his constant abandonment to divine providence.” It is this character trait, which led to the opening of the process of beatification and canonization for Paul VI. Pope Paul VI caused considerable surprise in 1968 when, to the consternation of his aides, he publicly denied rumours of “scandalous behaviour”. Though rumours had circulated periodically as to Paul VI’s sexual orientation and possible homosexuality, with suggestions of a past relationship while he was an archbishop with a priest who had served as his secretary, when these suggestions began to feature in some elements of the Italian media, he made the controversial choice of issuing a public denial. It was the first time in the modern era that a pope had commented in any way about his sexual identity. ^ Nuncio Ratti was asked by the authorities to leave Poland as Nuncio. ^ It was founded in 1971 answering to the will of Paul VI, in the spirit of renewal launched by the II Vatican Council. ^ In theory any male Catholic, even a layman, is eligible for election to the papacy by the College of Cardinals, so Archbishop Montini could still have become pope in 1958. In fact, his photograph was published in Life magazine with the other potential candidates for the Papacy, following the death of Pius. However, the cardinals in modern times almost always elect a fellow cardinal to the office. ^ “CAPOVILLA, Loris Francesco (1915-)”. Cardinals of the Holy Roman Church. Retrieved 22 February 2014. ^ “Catholic Press” (translator). Microsoft. Retrieved 23 June 2013. ^ “translator”. Microsoft. Retrieved 23 June 2013. ^ “Pope Paul VI to be beatified October 19, 2014”. Vatican Radio. 10 May 2014. Retrieved 10 May 2014. ^ Hebblethwaite 1993, p. 118. ^ Actes et Documents [Acts & documents] (in French) I–XI. ^ [[#CITEREFHebblethwaite1993|Hebblethwaite 1993]], p. 155. ^ “Biography”. Pope Paul VI: 1963–1978. Rome, IT: Vatican. Retrieved 2 March 2006. ^ Tardini (1960). Pi XII. Roma. p. 157. ^ L’Osservatore Romano. 17 November 1958. p. 1. ^ Weigel, George (21 April 2005). “Conclaves: Surprises abound in the Sistine Chapel”. The Madison Catholic Herald Online. Retrieved 13 February 2014. ^ a b c Hebblethwaite 1993, p. 339. ^ “Note Storiche”. Annuario Pontificio [Pontifical annuary] (in (Italian)). 2005. pp. 1820 ff. ^ Montini, Giovanni Battista Enrico Antonio Maria (15 June 1966). “Ecclesiae Sanctae” (Apostolic letter) (motu proprio ed.). Rome, IT: Vatican. Retrieved 12 September 2010. ^ Joseph Ratzinger (7 July 2007). “To the Bishops on the occasion of the publication of the motu proprio ‘Summorum Pontificum‘“ (letter). Rome, IT: Vatican. Retrieved 12 September 2010. ^ “Apostle Endangered“. Time, 7 December 1970. Retrieved 13 April 2007. ^ Montini, Giovanni Battista Enrico Antonio Maria. “Speeches”. The Vatican: The Holy See. Retrieved 23 June 2013. ^ “The conflict in Vietnam widens”. In Review. UPI. 1965. Archived from the original on 26 July 2013. ^ “1968 Year in Review”. United Press International. Retrieved 12 September 2010. ^ Germain Grisez on “Humanae Vitae,” Then and Now. Retrieved 2 March 2006. ^ Kenneth A. Briggs (7 August 1978). “Pope Paul VI Is Dead of a Heart Attack at 80; Guided the Church Through Era of Change”. The New York Times. Retrieved 21 July 2007. ^ “Paul VI : on the path to sainthood”. Vatican News Service. Retrieved 20 December 2012. ^ “Alleged miracle puts Pope Paul VI one step closer to sainthood”. US Catholic. Retrieved 5 January 2014. ^ “Pope Paul VI ‘to be beatified this year‘“. 24 April 2014. Retrieved 25 April 2014. ^ “Paul VI set for beatification”. ANSA. 6 May 2014. Retrieved 6 May 2014. ^ Leiber, Robert (December 1958). Pius XII. Stimmen der Zeit. ^ de Rosa, Peter (1989), Vicars of Christ: The Dark Side of the Papacy, Corgi, p. 538 . Ernesti, Jörg (2012). Paul VI. : Der vergessene Papst (in (German)). Freiburg im Breisgau: Herder. ISBN 978-3-45-130703-4. .
Fappani, Antonio; Molinari, Franco; Montini, Giovanni Battista (1979), Giovane, documenti inediti e testimonianze [John, inedit documents and testimonies], Turino: Maretti . Franzen, August (1988), Papstgeschichte (in (German)), Freiburg: Herder , quoted as Franzen. Guitton, Jean (1967). Dialog mit Paul VI [Dialogues with Paul VI] (in (German)). Wien: Molden. .
Hebblethwaite, Peter (1993). Paul VI: The First Modern Pope. Paulist Press. ISBN 0-8091-0461-X. .
Lazzarini, Andrea (1964). Paolo VI, Profilo di Montini [Paul IV: profile of Montini] (in (Italian)). Roma, IT: Casa Editrice Herder. quoted from Papst Paul VI (in (German)), Freiburg: Herder, 1964 . Malachi Martin (1972). Three Popes and the Cardinal. New York: Farrar, Straus & Giroux. ISBN 0-374-27675-7. .
Pallenberg, Corrado (1960), “Inside the Vatican”, Michigan University (Hawthorn Books): 273 . ———, The writings, Saint Mike . ———, “Quotes”, Brainy Quote . Montini, Giovanni Battista Enrico Antonio Maria, Opera Omnia [Complete works] (in Latin; multilingual), EU: Documenta catholica omnia . Wojtyla, Cardinal Karol, The truth of the encyclical “Humanæ vitæ”, EWTN . “Tomb of Paul VI”, Vatican Grottoes, St. Peter’s Basilica . Impostor, TLDM , comparing pictures of Pope Paul VI to ‘prove’ he had been replaced by an actor while the real Pope Paul was ‘kept drugged’ in the Vatican. “Pope Paul VI”. News (footage archive). UK: Pathé News. .
“Paulus VI, a forgotten pope”, YouTube (video) (in (Italian)), Google . “The assassination attempt of Paulus VI”, YouTube (video) (in (Italian)), Google . “The last years of Paulus VI (G.B. Montini 1974–78)”, YouTube (video) (in (Italian)), Google . This article uses material from the Wikipedia article Pope Paul VI, which is released under the Creative Commons Attribution-Share-Alike License 3.0.